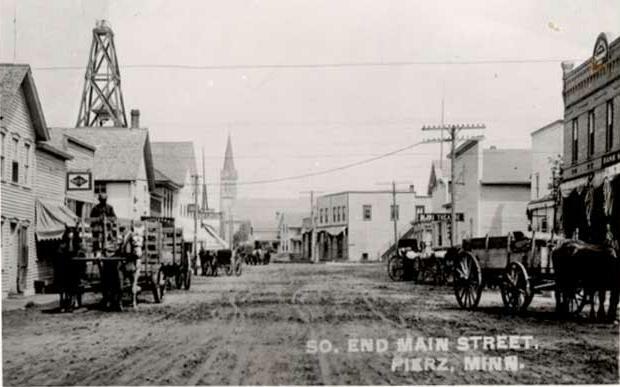 HESCH HISTORY: Let's compare photos of downtown Pierz, ok? 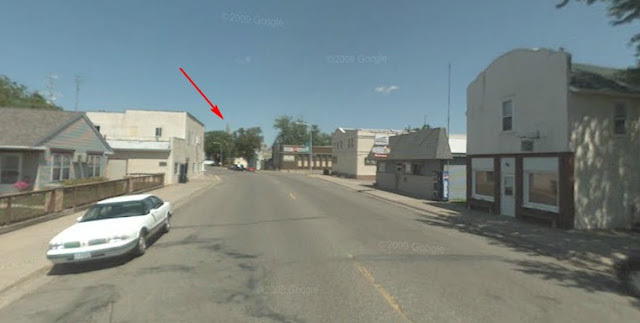 Let's compare photos of downtown Pierz, ok? Last night was rainy/stormy in Georgia where Larry is (g'head, sing along), and frightfully cold here (which sounds like I'd have been out sledding if it'd been only -5, but nope, I wouldn't have been). 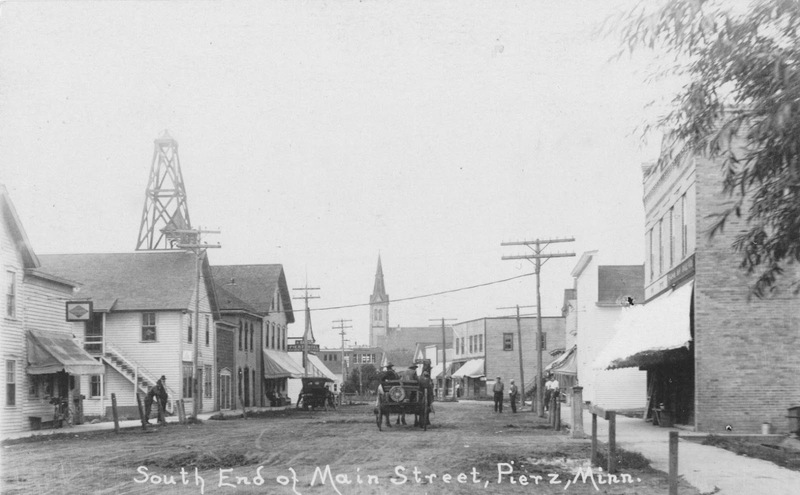 So, we decided to investigate these photos of Pierz, Minnesota, instead, as anyone would. Four--no five--views of Lower Town Pierz--all looking north toward the church. Larry and I were trying to figure a date for each of em. 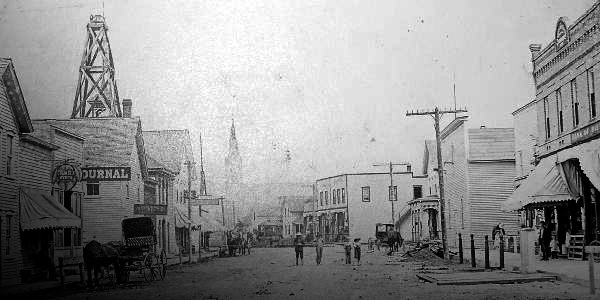 The above, we're pretty sure, was taken in 1908. 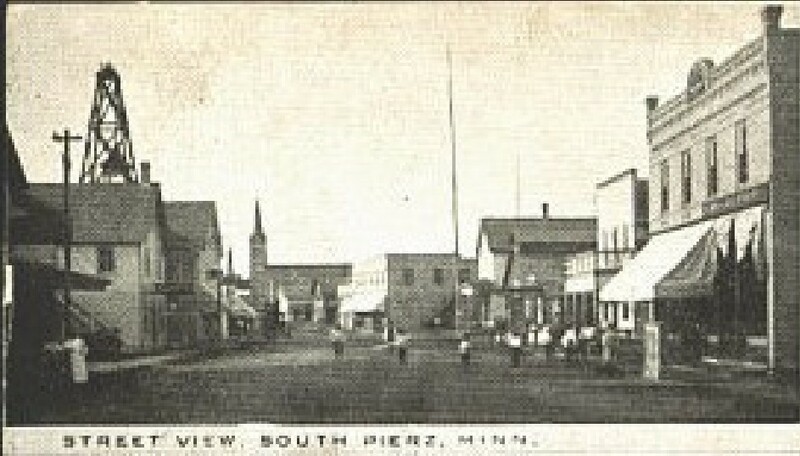 (It came from a postcard showing four views of Pierz that SAID "1908"). The last one is the Google Streetview from 2009, just for shits and giggles. The second one looks sharper, so it feels more recent, but there's a ragged awning on the left, an awning that looks new in picture 3. Then too, see the outside staircase on the white building? It's not there yet in the third photo. The wooden fire tower with the city hall steeple behind it shows in all four. BTW, the hose-drying tower held the fire-alarm bell, too, just so ya know. These two guys in front of the staircase caught our interest. I've convinced myself that the one with the white beard was John Heach ☺. The other man, we think, had parked his bicycle a few feet away in front of the place with the Grain Belt Beer sign. 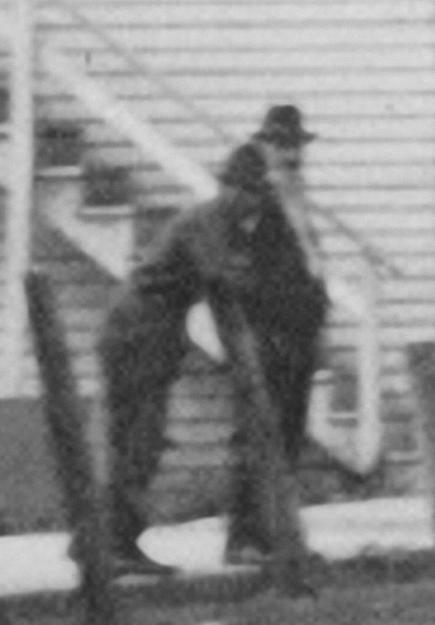 The photo is even more interesting if you enlarge it to full screen--see the car parked to their left? Right above it a sign says "PIERZ HOTEL", and across the street on the Neisius building (nearest the viewer), we think the darker half-sign says "BANK OF PIERZ'. Since the new German State Bank building opened in December 1916, this gives us another parameter. The PJ mentions the bank well before 1916, and there were paid ads in the paper, too, as early as 1914. (Maybe earlier--but I noticed em in 1914 ☺). We've speculated before that there was a photographers studio on the south end--one who was enamored by the street and its muddy changing charm. This one looks like the same era as #2 up there, but see the sign on the third building on the right? We think it says BIJOU, which was the theater in town. We'll do a post about the enterprising Faust family soon. I'm fascinated by the relative size of the church tower in each of the photos. How can it figure so prominently in the first four but be almost invisible in the current one? Even if these old pics were taken from a step ladder, the google mobile camera is mounted on top of a car. THANKS to Carrie P. for "South End of Main Street, Pierz, Minn."